The aim of this lecture is to presentation on Query Processing. Query processing is the recovery of information from a database according to a set of recovery criterion, the database itself enduring unmovable. 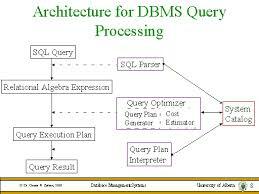 Basic Steps in Query Processing are: Parsing and translation, Optimization and Evaluation. This lecture also briefly focus on Measures of Query Cost, Selection Operation, Sorting, Join Operation and Evaluation of Expressions; all these are briefly discuss with examples. Here also focus on Merge-Join, Hash-Join and Complex Joins with explanation.